Pumpkin roll is such a fancy looking holiday season dessert that will bring so much joy to your little ones with each bite! 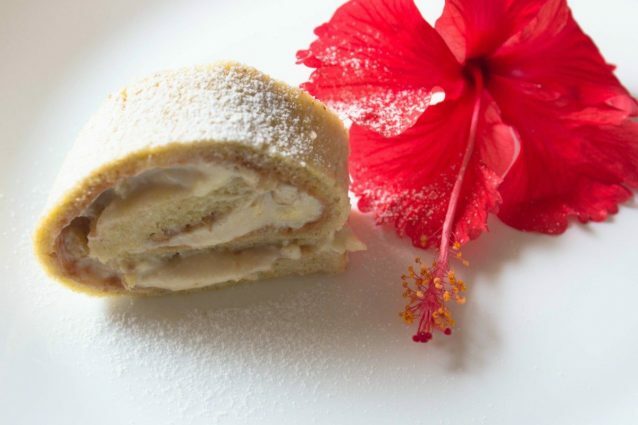 The soft cake filled with a creamy filling is such a delight, visible and otherwise, that I am sure you will give in to the temptation and skip a few patience worthy steps in between. Just like I do most of the times… yet the tempting pumpkin roll amazing each time! Preheat the oven to 180 degrees C and prepare a square or rectangle baking dish (with at least half an inch height) by placing aluminum foil on it. Brush the foil with olive oil very nicely so that the cake layer doesn’t stick to the foil on baking. Add the eggs in a large bowl and beat them for 2 minutes using an electric beater. Add 1 cup powdered white sugar to it and beat the mixture again until thick and fluffy in consistency. Whisk in the pumpkin puree and lemon juice slowly in the egg mixture. Add the refined flour, cinnamon powder, baking powder, salt, and nutmeg powder to the egg mixture. Fold the ingredients together carefully until well combined. Pour the cake batter in the prepared baking dish and bake it in the oven for about 20 minutes or until the cake cook through. Place an aluminum sheet on the kitchen counter and evenly sprinkle 1 and a half teaspoon powdered sugar on it. Now, transfer the cake on to the sugar coated aluminum foil (top side down) and peel off the aluminum foil stick to the base of the baked cake. Carefully roll the cake in to a large cake roll while holding the cake from the foil, so that the foil is rolled along with the cake layer as well. Cool the cake to room temperature for about 20 minutes. Meanwhile prepare the filling by, whisking cream cheese with yogurt in a bowl. Stir in powdered white sugar, butter, vanilla extract and whisk until the mixture is well blended and fluffy in consistency. Carefully unroll the cake and evenly spread the filling over the cake layer while leaving at least 1 to 1½ cms from the edges of the cake. Sprinkle the walnuts evenly over the filling layer and roll the cake again without rolling in the foil in between the cake layers. Cover the cake with foil and chill for about half an hour for the filling to set. Dust the pumpkin roll with about 1 teaspoon sugar powder. Move your hands or gadgets in one direction only while mixing the ingredients. Make sure there are no egg shells present along with the broken whole eggs. You may replace vanilla extract with vanilla essence a well in similar quantities. Do not over bake the cake, else it will become dry and crusty. Pumpkin bread rolls: perfect for the fall! Pumpkin roulade: a unique and tasty recipe! Pumpkin meatballs: easy, quick and tasty!